Smart phones have changed the world. Information has never been more accessible, and mobile capabilities are constantly multiplying. Businesses are integrating their systems with smart phones and utilizing mobile technology to expand their horizons. Prospects and customers can find your web site from anywhere in the world with just a few clicks, giving your business a greater opportunity to be seen. Smart phones are essential in business today, and you will greatly benefit from their possibilities. Manage your business just from your phone ! Countless doors will open when you merge your business with smart phone technology. 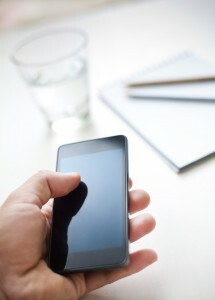 Creating tools & apps for your business is a great way to reach customers in the mobile market. Mobile apps are often similar to mobile web sites but tend to load faster, look better, and provide more functionality. They are also easier to access; the user just clicks on your app from the home screen and instantly connects your services. Smart phones have changed the game, and when it comes to business, you will find it very rewarding to integrate your systems with smart phone technology. You will be amazed at all the things you can do on your phone without ever having to carry around a laptop. Customers will be pleased when they see you have an app for your business that looks great and provides them with convenient access to your services. Don’t wait any longer. Grow your business with smart phone technology !